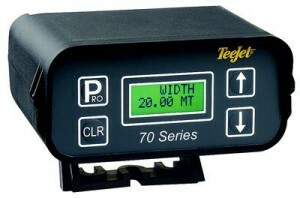 The 70 range of TeeJet Spray Equipment monitors and controllers will enable a full range of monitoring and control functions. The compact enclosure is equipped with four buttons and a clear dot-matrix LCD dispay. It can be mounted in any position and is designed to be rugged and dependable.